The King is back. Kenny Dalglish has returned to his spiritual home as the new manager of Liverpool Football Club. This new official club magazine celebrates his second coming as Reds boss by looking back on his amazing life as an Anfield legend. It revisits the career of arguably the finest player to pull on a red shirt, reliving Kenny s many highlights which included three European Cup triumphs and five league title successes between 1977 and 1985. The 84-page publication, priced £3.99, also focuses on the last time he took charge of Liverpool, leading the club to a famous Double in 1986 and two further First Division championships before dramatically quitting in 1991. It is packed with classic archive images and tributes from fans and former players as well as insight and revealing stories from the great man himself. 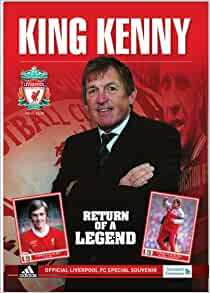 King Kenny: Return of a Legend is a must for Reds who remember the genius of Dalglish first time around plus younger fans wanting to know more about the magic of the King of the Kop.